In April, 2015, Harvard undergrad David Zhang presented a thesis on ultimate analytics to the Department of Applied Mathematics (archived PDF version). The thesis has some nice diagrams of basic concepts that may be useful to youth players and coaches. Black circles are offense; black lines are defense. The white circle is the disc. The mark is trying to “force” the handler to throw a (right-handed) flick to the open side, thereby allowing the other defenders to be a few steps ahead of the offensive player they are guarding. 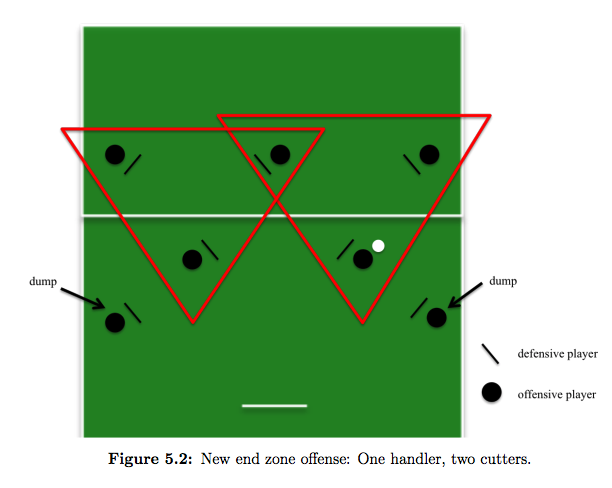 The basic two formations for any offense are the vertical stack and the horizontal stack. Any other offense is a variation of one of these two formations or a hybrid of the two. 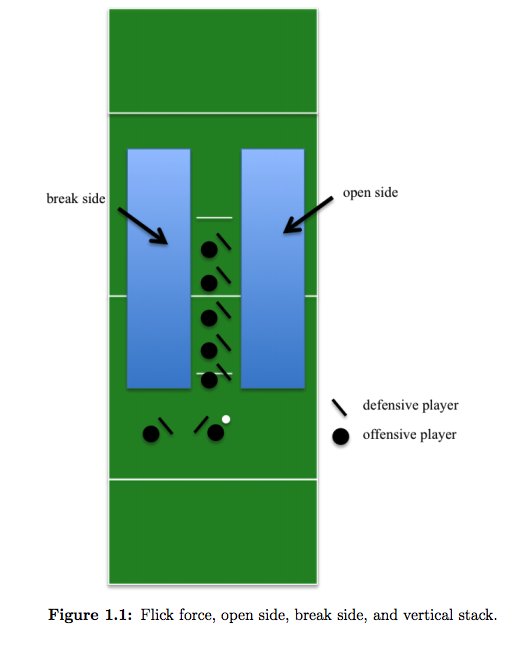 The vertical offense employs two handlers in the backfield and five cutters spread vertically downfield, creating a perpendicular L shape. Usually, the vertical stack lines up centered with the disc so that there are two lanes to throw into: both the open side and break side (see figure above). The horizontal stack uses three handlers in the backfield with four cutters spread horizontally downfield of the handlers, creating a parallel set of two lines. The same principles in a vertical stack hold true in a horizontal stack. In either stack formation, the cutters have one of two options to cut: either “deep” (away from the handler) or “under” (toward the handler). The horizontal stack is the most popular form of offense right now at most levels of ultimate. However, most elite teams default into a vertical stack in the “red zone.” Generally, the exact type of offense is less important than the overall idea of maintaining space on offense and throwing to favorable matchups. 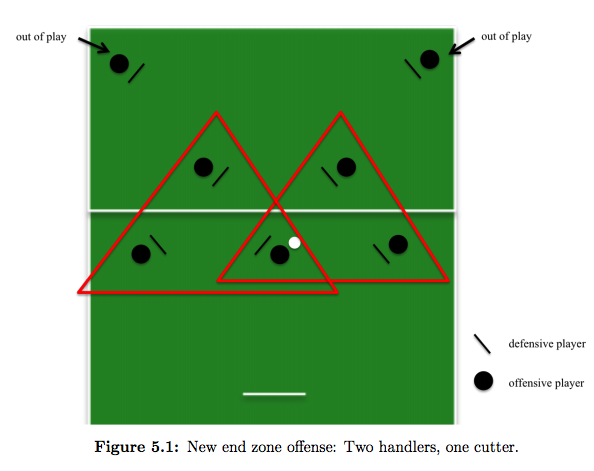 Zhang’s thesis also proposes two alternative offensive strategies for the “red zone” — the area within ~10-20 meters of the front of the endzone where you’re trying to score. The conventional strategy is to form a vertical stack, but Zhang argues that fewer players in a limited space give the offense an advantage. So he suggests isolating two offensive players (and their defenders) either in the back corners of the endzone, or as dump opportunities for the initial handlers. Finally, he suggests thinking of the remaining 5 players as two triangular groups working to score in the increased open space within the endzone. have easily switched them around. The five other offensive players are the intriguing part of the end zone offense: Both sets rest on the principle of three players working the disc. The first end zone set sees two handlers and one cutter, and the second set sees one handler and two cutters. Depending on the strengths of the offensive team and the individual match ups on defense, teams should adapt one of these two end zone sets in order to maximize their chance of scoring. Just before each game, my team of 40-70 year olds (Che‘s motto is “Old, but slow.”) traditionally runs an “endzone drill” in which we form a central vertical stack spanning the endzone and practice cutting from the back of the stack to the front corners of the endzone (with handlers cycling from the front of the stack through the “red zone”). These new ideas from Zhang suggest we may need to create some new drills — with some folks practicing staying out of the way while others learn to throw and cut in equilateral triangles!